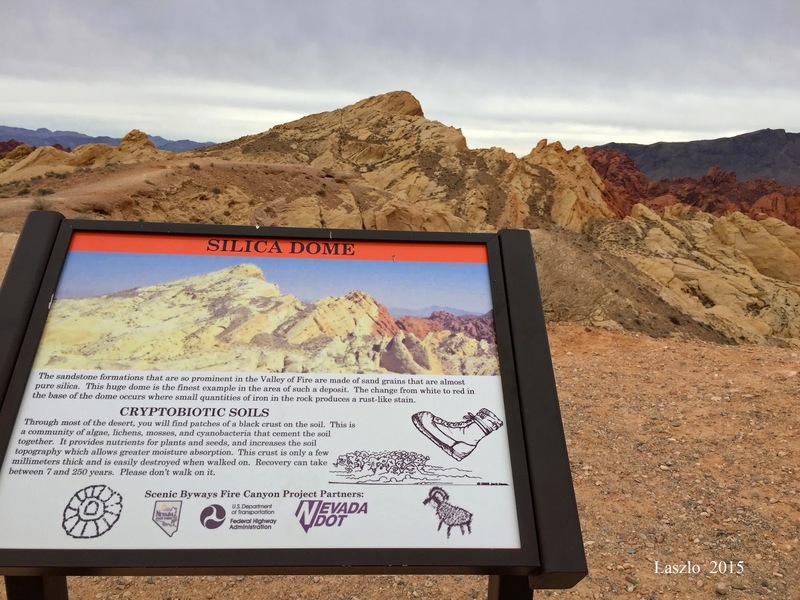 Eighteen hikers arrived at the Silica Dome trailhead parking lot at the end of Fire Canyon Road in the Valley of Fire State Park. 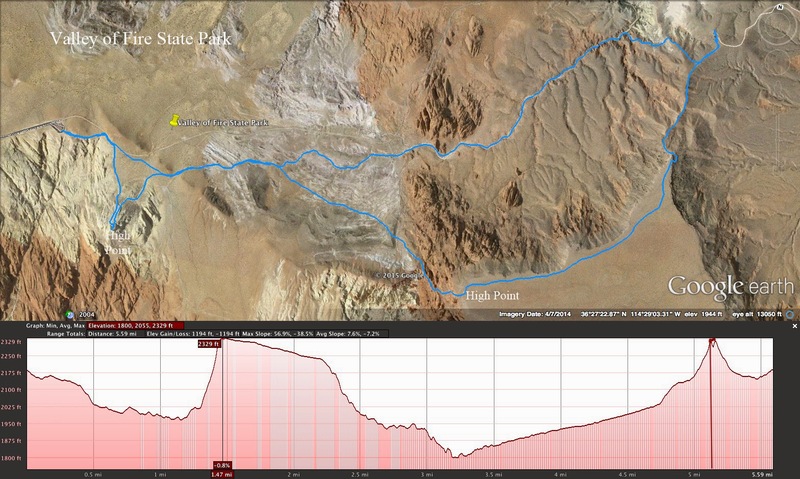 The route today would take us to the Painted Pinnacles, up to the top of Baseline Mesa, across and down to a set of mysterious old building ruins, and back via an interesting sandstone wash. Most of us topped out the hike with an up and back peak climb of Silica Dome. We started by dropping down past the "Danger" sign at Silica Dome. There is an old trail here. 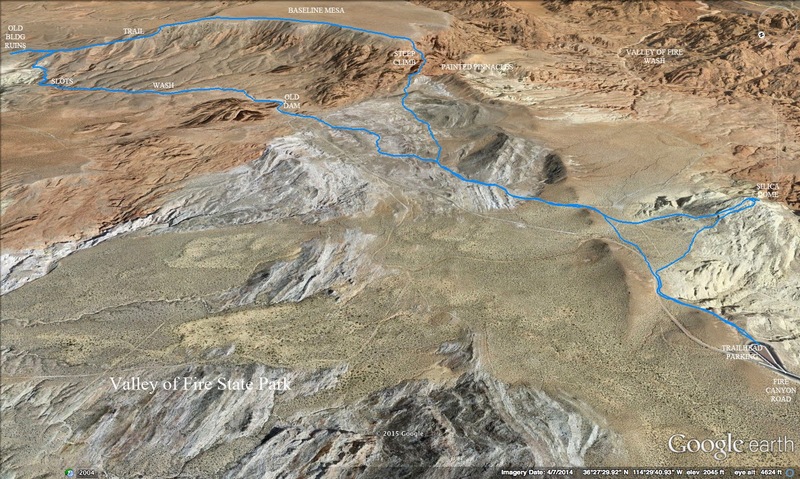 The trail became an old road then turned into a romp across the desert terrain to our right. As we crested a lip of the rock, we were absolutely wowed by the Painted Pinnacles that lay before us. The bright colors bled from a dark red at the top to a bright yellow at the bottom with a few splatters of red and orange in the middle. After taking in the scenery from the overlook, we turned to our left and began the most difficult part of the hike, a steep climb up to the top of Baseline Mesa. Brian, our coordinator of Valley of Fire extraordinaire, was well-versed on the best path up through the loose rock and sandstone slab. If our lungs didn't give out, we were good! We all kept looking back behind us toward the Painted Pinnacles to see it from every elevation mark. We also had a fantastic view of other regions of the park. The widespread silica sandstone that made the Valley of Fire park so colorful could be seen from our high perch. Eventually, all eighteen hikers made it to the top. A large, very flat, plateau laid before us. The terrain was sprinkled with rocks and desert foliage. We hiked the half mile or so of the length of the mesa until we reached the end point that had a view of the silica mine nearby. Tucked into a nearby crevice of conglomerate rock, a trail switchbacked down off of the east end of the plateau. The trail was narrow and hung off of the side of the loose dirt of the Baseline Mesa. We circled around to the north side and dealt with a couple of very slippery spots. The trail led us along a very tiny ridge with steep slopes on either side. It was difficult to keep our eyes on the trail and the gorgeous scenery in the distance! The trail turned into an old road and soon, we arrived at the ruins of an old building complex. There was a main building, fire pits, possible previous sun shelters and, most interesting, two latrines. The latrines were built in a spiral shape down below the main building. We took our break at the ruins and speculated about what this building used to be. Our imaginations (maybe working overtime) surmised that it was a sort of visitors' center for those that traveled the Old Arrowhead Highway that ran near here. Perhaps the trail up to the mesa was their overlook. At any rate, we finished our break and retraced our steps up the road a little then dropped down into the wash below. We were dropping into the area below a large earthen dam that was built for one of the silica mine's ponds. It was a little unnerving to walk beneath the huge old thing but we knew the pond above it was dry. Our drop to the wash included a nice slot that we each had fun descending with our own methods. Soon, another slot presented itself after we turned to the left in the wash. The conditions warranted an up and around for most of us. The sandstone wash was very pretty as it swayed back and forth around us. 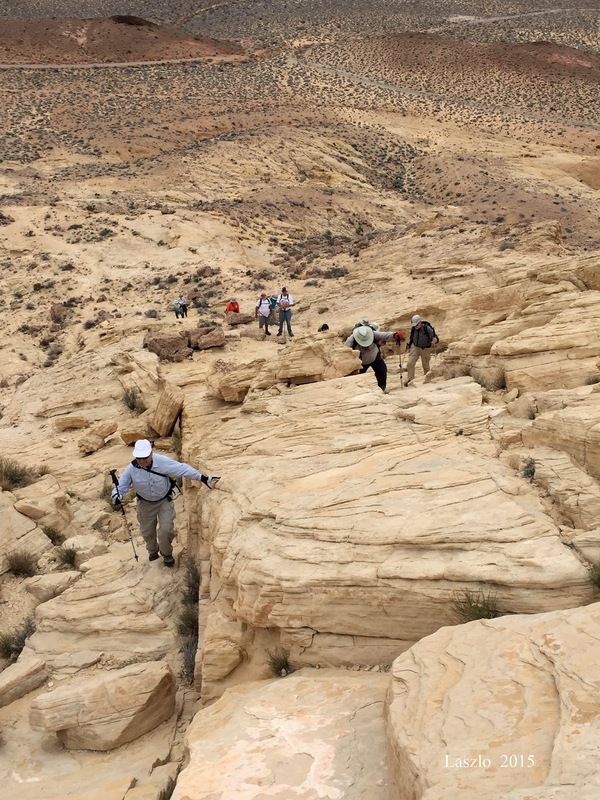 At first, it was mostly sandstone but as we advanced up the gentle climb, more and more sand appeared. Brian kept the pace going at a good clip so there was little time to stop and appreciate the small arches and windows on either side of us. Still, a few of us dragged our feet at the end of the line! When the wash turned a corner to the right, we saw the evidence of an old wildlife dam. The dam is now filled in and overgrown. Rusted barbed wire sits to the side. Wildlife does just fine without us sometimes. The wash changed from red sandstone to sand to pink sandstone as we neared the vicinity of Silica Dome again. Reaching the original old road of the hike, we divided into two groups: those that wanted to hike to the top of Silica Dome and those that wanted to go on back to the cars. The larger group separated toward the dome and up we went. Some of us went for the climb and some of us went for the view. And, what a view it was! As the sandstone became very steep, a look around gave us different perspectives of what we had already seen today. Some of us lithely scrambled up the steep slope and others, well, we were slower. This was obviously the area that the "Danger" sign was warning the tourists about. There were steep slopes and drop offs on every side. After a few quick photos at the top, we began the precarious descent. We followed the same trail that many before us have followed. (Although, that didn't make it any easier!) Finally at the bottom, we circled back around retracing our steps from when we started out earlier. 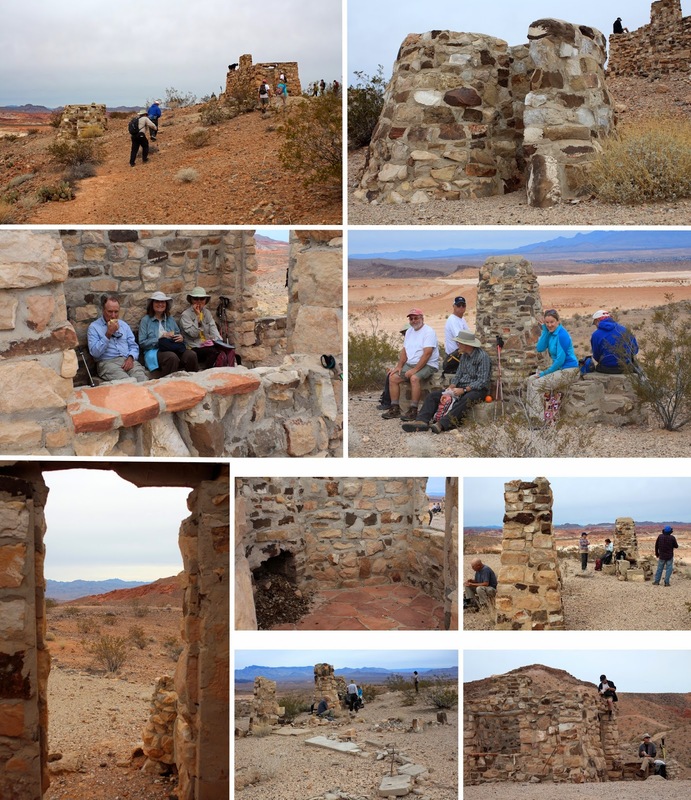 Another fantastic Valley of Fire hike! 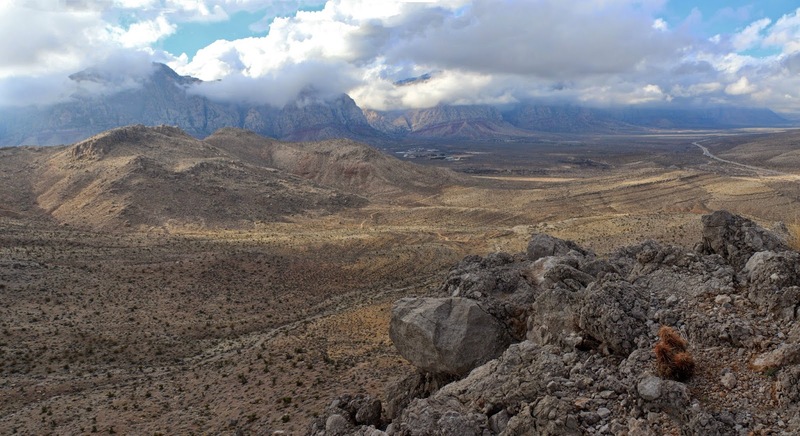 The rain cleared out mid-morning and left behind a huge blanket of fog and clouds in the Red Rock Canyon vicinity. 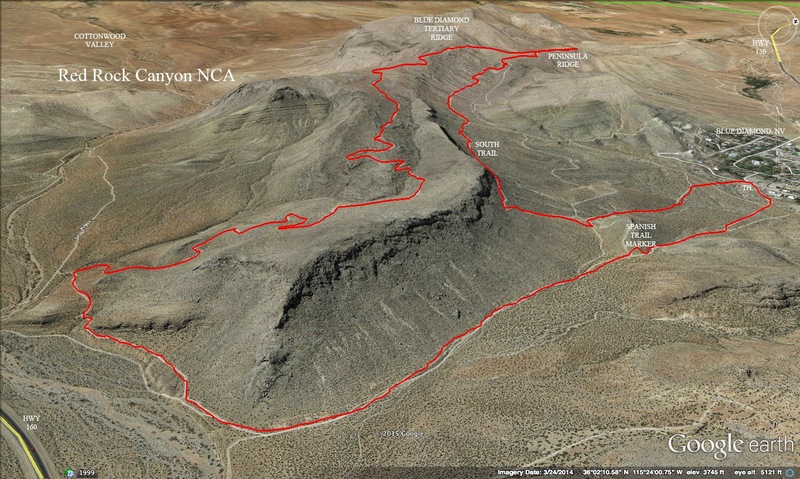 Two hikers decided to take a stroll in the hills behind the Blue Diamond, NV community on the bike trails. Kay and Janet parked at the upper trailhead parking in Blue Diamond and started down the trail. Note: The community has blocked off much of the space for parking here. There are no signs but be advised that if you can park at any of the other trailheads, it is best to do so. 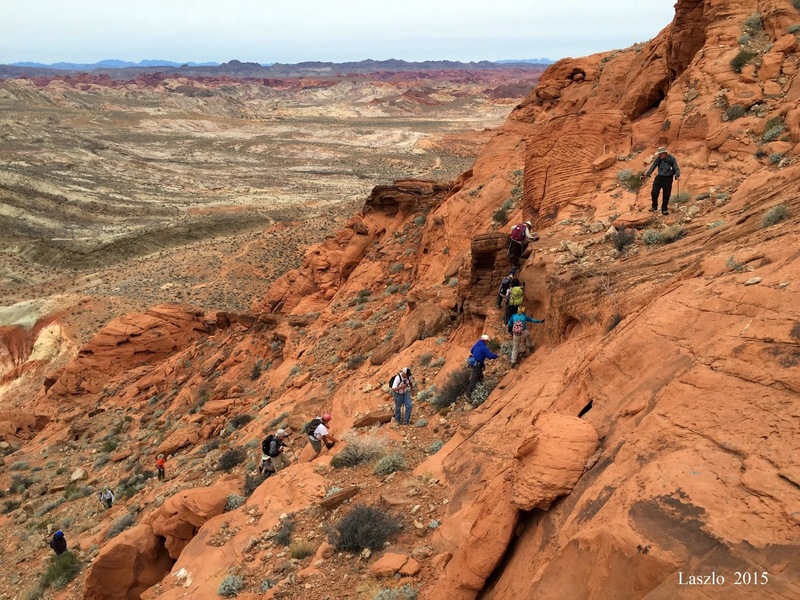 The weather was not stopping the many hikers and bikers of Las Vegas. The scenic loop was closed for a short time this afternoon yet there were many cars parked at First Creek. We passed several bikers on our trail going out. A brief visit of the Spanish Trail marker and we were on our way around the corner where we saw where Mt. Potosi's summit was supposed to be! The fog hung low on the peak and the whole of the Red Rock escarpment. We climbed the hill up to the tertiary ridge. The large views around us were interesting. It isn't often that Red Rock Canyon is covered with fog and low hanging clouds. The sun broke through once in a while as we hiked. 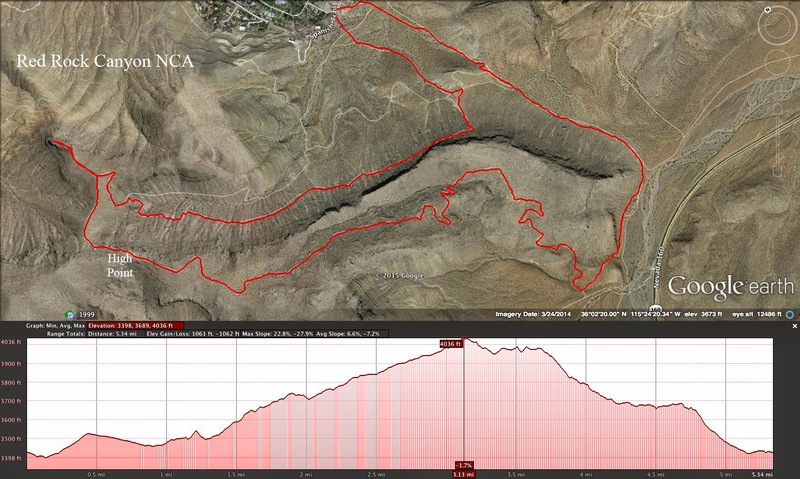 When we reached the sandstone rocks that are usually used for a break spot, we began searching for a trail that appears on the satellite map that leads down to the Landmine Loop. It isn't obvious so we decided to hike out a ridge that juts out from our location to see if we could see it from there. We could not but it was decided that this is a great small excursion and could be used for a new break spot. 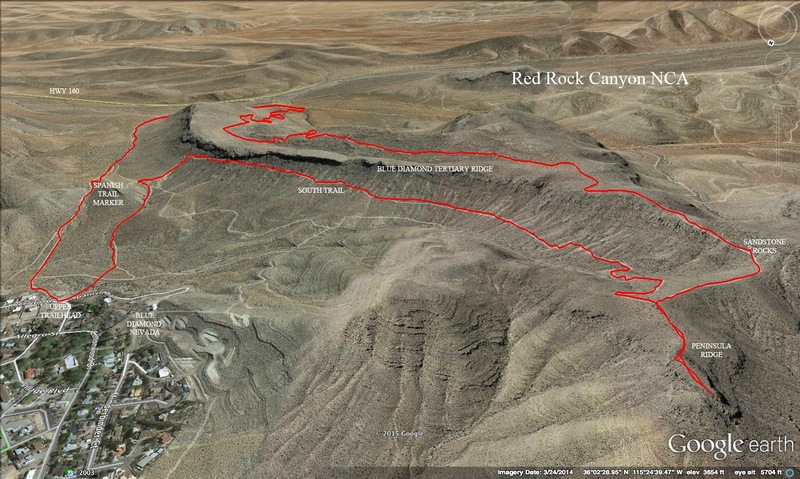 We returned to our trail and descended down to the south trail that runs along halfway down the tertiary ridge. At the end of the ridge, we dropped down to the Spanish Trail marker area and turned left. This trail took us back to the cars. Beautiful day.